My friend Mickey and I have a lot more in common than our birthday. We most often come together when food and wine are involved. I’ve tried to feign foodie forever, but the truth is that I don’t know parsley from persimmon. I gave up the act, but what I haven’t given up going out for a night of tapeo, washed down with one of Spain’s many DOs. Mickey happens to know a bit more about wine than I do, which makes going for a meal with her a treat. The New York Times recently wrote that Seville is undergoing a sort of renaissance where Soho-like pockets are popping up all over the city, a barrio with boutiques, gastrobars and mismatched furniture on the corner. Mickey lives right in the thick of it, so when we decided to meet for tapas on Thursday night, she rattled off a list of three places that had popped up while we were away for the summer. We settled on Barajas20, a halfway point between traditional bars and a gastrobar. The old hallmarks are on the list – croquetas, pavia de merluza, espinacas – but done with a bit more flair. I had a feeling I was going to like Mickey’s find. 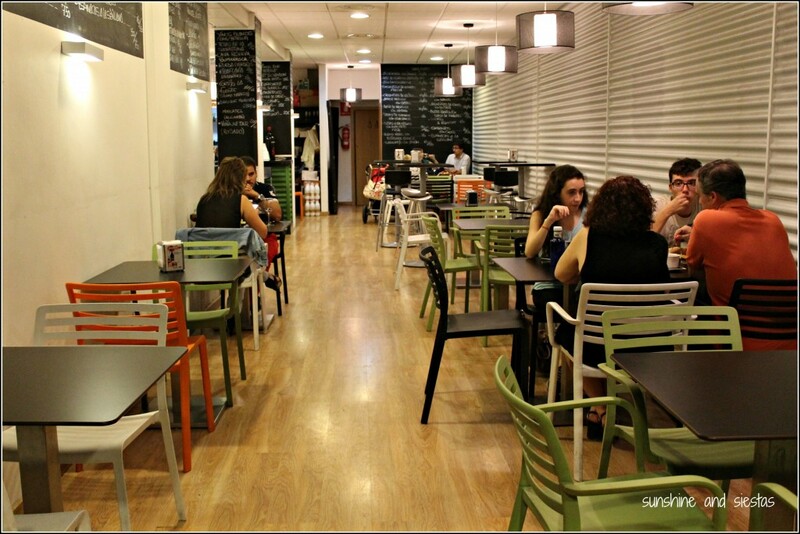 Spilling light out onto Calle Conde de Barajas, just a few steps from Plaza San Lorenzo, the bar resembles a college dorm cafeteria at first glance – naked walls, colorful plastic furniture, young clientele. Mickey and I took the lone table on the street and were immediately attended. Two glasses of Ribera, per usual. Mickey ordered salmon steak with guacamole and mushroom risotto. I asked for the risotto and pig cheek ravioli, wanting to compare it with other bars of similar caliber. For our palates, the star dish was most definitely the salmon, as the rice was a bit undercooked and the ravioli was nothing stellar. Note to self: Best not to try a gastrobar on a Sunday, when ingredients are likely not as their freshest. 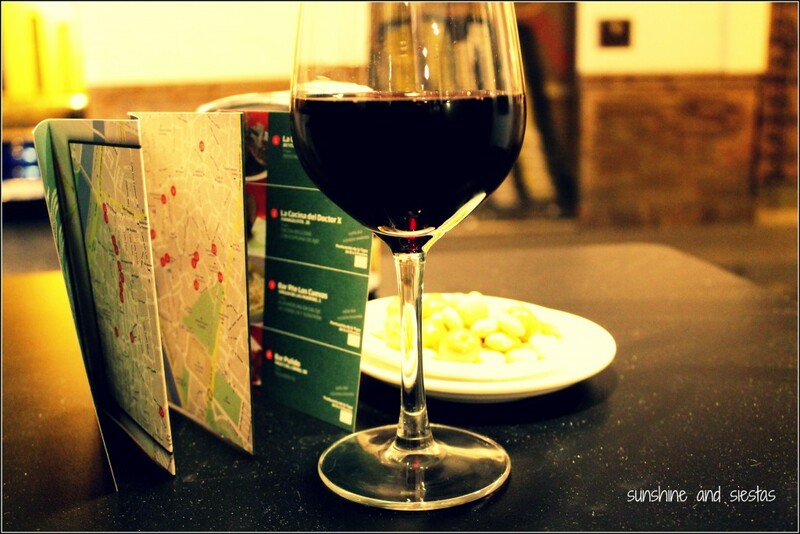 Rather than sharing another tapa, we chose to have another glass of wine. A couple and their slick greyhound had dragged a table out onto the terrace and ordered a glass of white: Las Tetas de la Sacristiana. As it turned out, Edu was a wine distributor and a fixture at his neighborhood bar, along with other big names in hostelería. Las Tetas was his star brand, made from tempranillo, cabernet and merlot grapes. Light yet robust, it was a perfect addendum to a meal. The head chef came to ask about our dinner and drinks. Mickey ld off with the fact that I was a blogger and often write about food and culture, offering him up a business card. One of the original partners of the group, he and some friends had built the place from the ground-up, staying strictly middle-ground – not too pijito and not too gritty. Their plans are to make it a bit more local by adding a rotating art gallery, changing the menus according to the season and wine tastings. He explained that they tend to have a steady house red and white while rotating in and out different D.O.’s – denominación de origen. With a click of his fingers, we had a limoncello in front of us. I’d be willing to give Barajas20 another try on a weeknight. While the food didn’t impress, the service and attention certainly did. And, if you end up leaving hungry, you’re just steps away from one of Seville’s best-known tapas bars (with reason), Eslava. Been to Barajas20? What did you order? 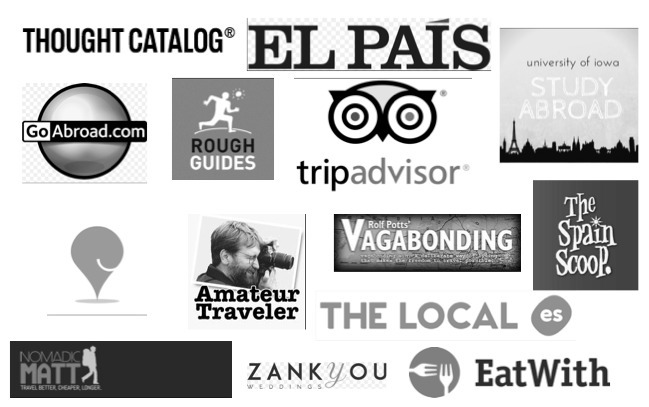 Know of any other great eateries in Seville? Want me to come along and eat? Seville is appealing to UNESCO to add yet another award to the city as the World Capital of the Tapa, so stay tuned for more gluttony from the Hispalense! Yup…this foodie is supremely jealous. Great stuff! Next time you’re in town, let me know! I live outside the center and have to make special trips in for food, but it’s worth it! I wasn’t a fan of Spanish food when I studied abroad, but I’m glad I changed my mind! I miss living in Seville reading this! Tapitas… miss them so much!!! You know you and Ale are ALWAYS welcome! I need to return the favor of having spent so many nights in your place! Sweets, you know a lot more about food and wine than you give yourself credit for!!! But I do appreciate your compliments!!! Walking around El Arenal tonight, I came across a couple of new places I want to try with you…You’re right, while our expectations weren’t fully met when it comes to food (not that it was “bad” but rather because our standards are getting higher), the wine and company made everything worth it…such a good night! We still have Lumbreras to try! And La Flor de Sal now does Saturday night wine courses too…te apuntas? And…I have to show you this place on calle Regina…amazing wine collection with gourmet food! Besos! Thanks, dear! YES to all of the tastings, etc. I’m thinking about starting a Thursday tapas segment on my blog. Thoughts?? Ahhh… Tapas in Spain. Sounds absolutely wonderful! Have you been out here? You don’t know what you’re missing! !